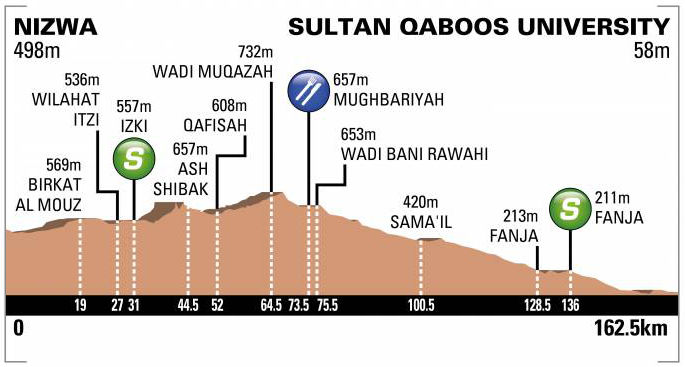 Beginning with a 162.5km stage from Nizwa to Sultan Qaboos University, day one of this year’s Tour of Oman should be a chance for the sprinters to start with a bang. 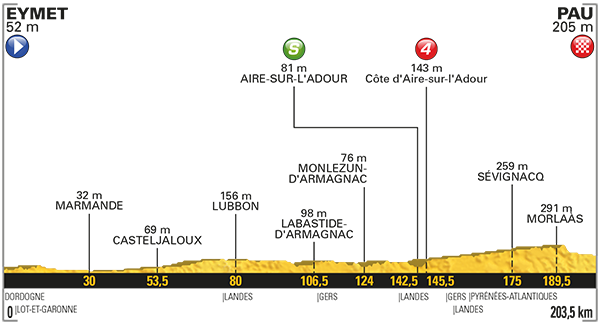 Though the roads rise somewhat after leaving the day’s start town, the second half of the stage is an extended descent which leads the peloton down to the finish, giving it the appearance of a day which the sprint teams shall be able to control easily enough. With the final turn coming at the flamme rouge, we should see a hotly contested sprint finish on wide roads, offering up a drag race amongst the best riders here. Nacer Bouhanni is said to be undergoing a transformative experience these days, the hopes of many seeking to salvage the mercurial talent from the peloton’s most acquired taste in recent years, with signs positive so far. The provocative Frenchman mustered some encouraging signs during the Dubai Tour, though was unlucky enough to crash on the final bend of the last stage when looking well-positioned. His impressive turn of pace and ability to surf the wheels should serve him well amongst a pack lacking many dominant sprint trains, so should have eyes on the podium at the very least on Stage 1. Mark Cavendish picked up a stage win during his recent time at the Dubai Tour and looks to be entering this race with a strong chance of collecting more early season victories. Though his support train has altered dramatically compared to last week, he will be able to rely on the talented young Scott Davies to position him safely during the final kilometre. A clear run at the line will be needed amongst a likely to be messy sprint, though years of experience do mean Cavendish knows how to handle himself by now. Magnus Cort was unexpectedly strong last week and ended up on the podium behind eventual winner Elia Vivani, but he is another sprinter who shall see many of his key lieutenants leave him, as the team’s focus switches to climbing the general classification instead of sprints. However, Cort is not one who necessarily demands a committed leadout train and has previously performed well when having to look after himself, so will be confident of challenging for the win. Adam Blythe surged late to push Elia Viviani close for the win on the final stage in Dubai, but had to settle for third as he just ran out of road before being able to overtake the Italian. With racing here likely to prove more attritional, Blythe could be able to draw closer to his faster rivals and take a surprise victory for himself. We once again arrive at the processional stage into Paris, Chris Froome having joined the exclusive club of four time Tour de France winners, despite never truly appearing to be the strongest rider in contention for the yellow jersey. Stage 21 will be a chance to relax for the Team Sky captain and his fellow riders, the common sight of champagne flutes being passed around the group, as others share family messages to the cameramen who have stalked them since the departure in Düsseldorf. 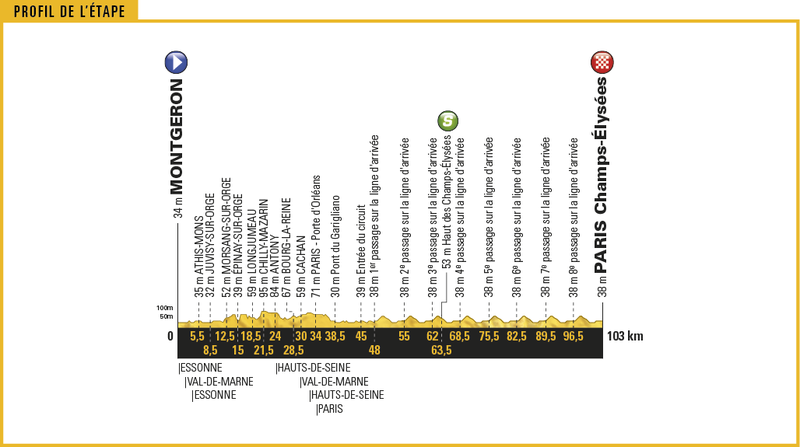 The stage itself is 103km from Montgeron to the iconic finale upon the Champs Élysées, featuring a total of eight laps around the capital, each proving more hectic than the last. Though many riders like to escape the bunch over the Parisian cobblestones, seldom do their efforts steal the win, this being a day for the sprinters to dominate. Having lost Mark Cavendish, Peter Sagan, Marcel Kittel and Arnaud Démare during the race, it may well prove a harder to control race than previously anticipated. André Greipel has already been backed by his fellow sprinters to secure another victory upon the Champs Élysées, a consistent performer when it comes to this tricky stage, the German now appears to be the fastest man left at the race. Despite having lost a key component of his leadout train in the shape of Marcel Sieberg, the team still have enough in reserve to offer him a protected ride into the final decisive turn of this curtain call upon 2017’s Tour de France. Assuming he is placed into the ideal position from which to sprint from, then it is unlikely that anyone else will be able to match the speed of the ‘Gorilla’. Nacer Bouhanni will do well to redeem his Tour de France by taking a surprise win on the final day, having had to endure a pretty torrid time throughout. Seemingly spending more time throwing punches then concentrating on the task at hand, the fiery Frenchman has spurned several opportunities at the race which looked ideal territory for him to win from. Morale is not great at Cofidis, so they could do with a win to say the least, yet it will take a lot of effort to muster something resembling a serious charge for Parisian glory today. Alexander Kristoff is another rider who has recorded a consistent level of results on this familiar conclusion to Le Tour de France, though has been unfortunate to miss out when it comes to crossing the line first. Last week he may well have emerged as the new favourite to win, but a serious fall which catapulted him hard onto the tarmac has dented his chances. Having recorded one of the slowest times in yesterday’s time trial, it is difficult to gauge if he is really suffering badly or simply saving his efforts for a stage he still believes he can win. The technical demands, positional requirements and draining cobblestones are all typical features of a Kristoff victory, and if he has truly recovered, then expect him to be pushing for the win as ever. Edvald Boasson Hagen finally took a well deserved stage win a couple of days ago, but will not be content with just that, as this has the potential to be another feather in the cap of the Norwegian at the end of 2017’s Tour de France. Now looking to be one of the freshest fast men still at the race, Team Dimension Data are likely to be a dominant force at the head of the peloton during the deciding laps around Paris, ensuring nobody dangerous gains too great a gap on the bunch. In terms of leadout, the Norwegian can expect to have the best on offer, though it is hard to say how hard he had to dig for his recent victory and whether they may have blunted his chances as a result. Others expected to feature amongst the top ten on Stage 21 are Dylan Groenewegen, Ben Swift, Michael Matthews and John Degenkolb. Having dealt with the Alps for another year, the race begins to settle down to terrain resembling something flatter during the final days of 2017’s Tour de France. Starting in Embrun, the day gets off to a lumpy start with the Category 3 pairing of Col Lebraut (4.7 km, avg 5.8%) and Côte de Bréziers (2.3 km, avg 5.6%), though eventually settles into a manageable rhythm of gently rising and falling roads. Having continued pushing onwards through the intermediate sprint at Banon, a downhill section leads into the foot of the Category 3 Col du Pointu, lasting for 5.8km and possessing an average gradient of 4.1%. From here it is essentially a flat run into the finish at Salon-de-Provence to complete their 222.5km day in the saddle. However, those hoping to take the win in a sprint finish will need to negotiate a technically demanding finale, one with a couple of roundabouts and numerous tight bends. Michael Matthews shall still be motivated to score points in the green jersey competition, even if only to hammer home the fact he has won it through great skill and not simply the abandonment of Marcel Kittel. 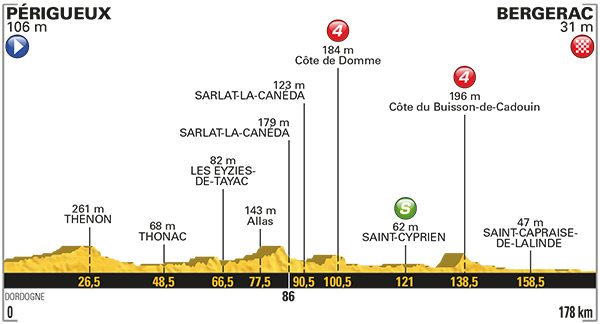 The length of today’s stage suits him well, as does the terrain, but it is the flat and technical finale which looks set to cause trouble for the Australian sprinter. Though his last victory came about after having to sail through a couple of tight bends before the finish line, this appears to be a more demanding finale and one which is unlikely to see a rider like Edvald Boasson Hagen make the same mistake twice. Regardless, his form is fantastic at this point of the race and it feels like there is not a challenge Team Sunweb cannot rise to achieve right now. André Greipel would be surprised if he left this year’s Tour de France without a stage victory, especially given the number of favourable days and the departures of Mark Cavendish, Peter Sagan, Arnaud Démare and Marcel Kittel. Today however does not look ideal for the powerful German sprinter, a rider notorious for becoming lost amongst the maelstrom of a tricky finish such as this. A fan of long power based sprints, Greipel will not be afforded such a luxury on Stage 19, though must not be ruled out given his pedigree at this level. His leadout train is diminished, making life harder still, but this could be an ideal test run of how to adapt ahead of a more desirable victory on the Champs Élysées. Alexander Kristoff survived a nasty spill during Stage 17, crashing as a result of striking a rut in the road while descending one handed in order eat, sending him sailing through the air and crashing to the ground. Having gained several abrasions and “a slightly dislocated shoulder”, there were suggestions he would not be able to finish yesterday’s ascent of the Col d’Izoard, but the tough Norwegian proved this was simply not the case. A fully fit Kristoff would normally be favourite for this type of finish, so his recent injuries shall certainly prove even more frustrating for him on a day which plays to his strengths. The final kilometres could erupt into a head to head battle for the line as tired leadout trains begin to fall apart, giving him the chance to pounce and gain a reward for his steely determination to survive. Edvald Boasson Hagen probably still thinks about how he should have taken the final bends of Stage 16, as a neater line would surely have sent him sailing past Michael Matthews in the final moments. Still on the hunt for a win at this year’s Tour de France, his Team Dimension Data squad have worked hard to produce competitive performances in the absence of Mark Cavendish, often finding themselves within touching distance of a breakthrough. He potentially sees himself possessing the best leadout train now present at the race, which is more than capable of launching the obviously strong Boasson Hagen onwards to a belated win. 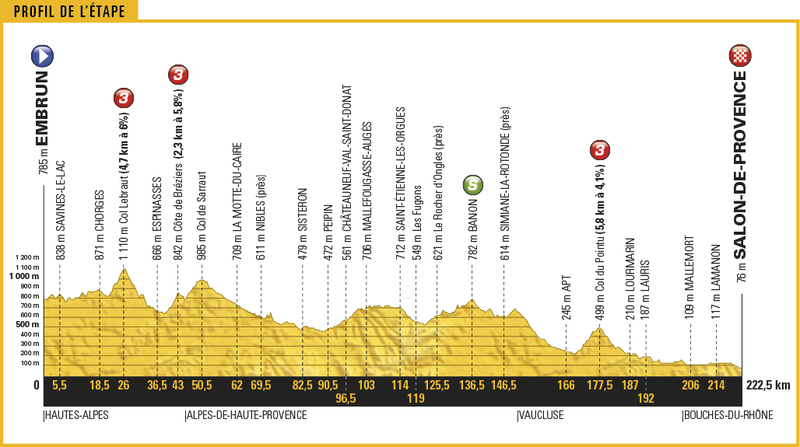 If there was going to be one stage for everything to finally click into place, for both team and rider, then Stage 19 is surely the occasion for it to happen. Nacer Bouhanni has proven to be a great disappointment at Le Tour de France this year and does not realistically look like obtaining his first stage win at his native grand tour anytime soon. He does favour these twisting conclusions to the day however and still has a reasonably strong outfit of riders in place to guide him through the final kilometres as best as possible. His greatest weapon is his acceleration, rather than his top speed or power, making this short finishing straight ideal for his skills to step into the spotlight upon. Likely to be hiding on the wheel of bigger names in the last moments of the stage, Bouhanni’s best tactic will be to burst forth from behind the frontrunner with a perfectly executed burst of pace. John Degenkolb held issues with the way in which Michael Matthews sprinted on Stage 16, though few professionals or pundits suggested that the German was correct to believe himself hindered by the Australian’s late manoeuvre. This hectic charge to the finishing line does not play to his strengths at all unfortunately, yet there is no denying that on paper he is now one of the fastest riders remaining. His second place finish behind Matthews showed that he can cope with a few late turns and does not deserve to be ruled out entirely because of previous form on similar finishes. The final week of a grand tour is always difficult to anticipate, but it would be a surprise to not see Degenkolb amongst the first five riders home. Others to consider are Dylan Groenewegen, Sonny Colbrelli, Greg Van Avermaet and Ben Swift. The first stage back after a rest day always generates a degree of trepidation for the riders, as some return feeling fresher after a day free of the rigours of racing, while others sense their form begin to go off the boil. Signalling the return to the saddle for the peloton is an 165km trip from Le Puy-en-Velay to Romans-Sur-Isère, offering little in the way of easing the riders back into the swing of things with its immediate uphill start. The opening rise forms the Category 3 Côte de Boussoulet, a 4.5km long ascent which averages a hard to ignore 6.3% gradient throughout its slopes. From its summit the road continues to roll for around another 40km, eventually tackling the relatively short Col du Rouvey and its subsequent fast descent. After dropping into the valley, the road does not feature a great deal of topographical challenges, though crosswinds could play a pivotal role in deciding the composition of any leading group late in the day. Whoever does reach the final kilometre first will face a very technically demanding run into the finishing line itself, with tight turns and roundabouts packed in to make things even more stressful. It may even prove tempting for some sprinters to chance their luck in the day’s breakaway in order to avoid such a hectic conclusion to Stage 16. Alexander Kristoff is a master at measuring his efforts when the crosswinds begin scything apart the peloton, even going as far as to say he enjoys their destructive nature and the familiarity it brings having spent much time cycling along the Norwegian coastline. His main goal will be to survive the opening climb within touching distance of his main rivals for Stage 16, after which if successful, there will be a great chance for him to collect a Tour de France victory in 2017. With the winds potentially turning this into an arduous return to racing, combined with a technical finale, Kristoff should be able to emerge as a major contender for stage honours here. Michael Matthews and his team will appreciate how crucial today could prove in the battle for the green jersey, having already secured a brilliant stage win in the absence of Marcel Kittel before the rest day. Stage 16 is another chance to turn the screw on the dominant German sprinter, likely aiming to make racing hard from the very start and hoping to drop Kittel as soon as possible. Though not renowned for his prowess in crosswinds, his teammates do offer plenty of experience in surviving the challenges it throws their way, so Matthews is likely to be in safe hands. A harder day will blunt the top end speed of his faster rivals, while the late turns and road furniture could derail a few leadout trains too, but he will need to be in the leading group before he can worry about victory. Matthews will be contesting this on an almost flat finish, so everything will need to fall perfectly into place if he is to stand a chance of winning and cutting the lead of Marcel Kittel upon the maillot vert. Greg Van Avermaet could prove to have eyes upon joining the day’s breakaway if able to muster the sort of form we have previously seen from the classics specialist at Le Tour de France. He knows that life will be hard if a bunch kick ends up deciding the day, especially given the lack of incline, but the Belgian has a great chance of being the fastest rider present if he smuggles himself aboard a successful move. Unlikely to fear life in the crosswinds, Avermaet will know how to look after himself as best as possible and even identify the riders who are most likely to contribute towards forming a breakaway which will survive a day out front. John Degenkolb looks to be on the up once again and Stage 16 does provide an opportunity which suits him more ideally than those which have already been sent his way. A powerful rider, Degenkolb is capable of producing the efforts required to make the cut if echelons form during the day; his immense strength a huge asset over his lighter weight sprinting rivals. Much like his countryman Marcel Kittel, his greatest challenge will be hauling himself up the opening climb of the day and ensuring he has enough left in reserve to battle it out in the final kilometres. He lacks team support to help him navigate the technical run into the finish, but a hard race could thin the ranks enough to give Degenkolb a better chance at victory. Edvald Boasson Hagen shall certainly want to see his current form put to good use and is another rider who could potentially join the breakaway if he does not fancy his chances in a larger sprint at the end of the day. He can certainly climb well enough on his day to make the key moves, has the strength to manage life in the crosswinds and is often one of the freshest at the end of a tough race. Team Dimension Data have been working hard to produce a good result since the departure of Mark Cavendish, so should view Stage 16 as an opportunity to finally see their determination secure themselves a taste of victory once again. Nacer Bouhanni has proven incredibly tough to gauge during this year’s Tour de France, though if he is returning to top form, then this will be the day to demonstrate so. With its anticipated nature and technical finale, Bouhanni has the tenacity required to ensure he finds himself stuck to the right wheel throughout Stage 16. Another fast finisher who lacks a convincing team support on days such as these, the Frenchman will no doubt see his chances of winning improve if the number of riders able to contest the outcome is greatly reduced by a hard race. Other names to consider for both sprint and breakaway are Ben Swift, Sonny Colbrelli, Stephen Cummings, Marcel Kittel, Dylan Groenewegen, André Greipel and Davide Cimolai. A return to days in the saddle which stretch beyond the double century marker, Stage 11 makes its way from Eymet to the seemingly ever present Tour de France town of Pau. 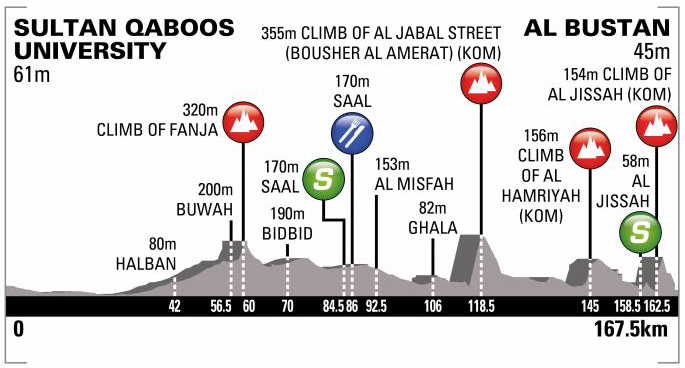 Totalling 203.5km from start to finish, there is very little in the way of elevation gain to worry about, with the vast majority of the day’s racing being contested upon flat roads. However, there is one recognised climb in the shape of the Category 4 Côte d’Aire-sur-l’Adour, which will be tackled after 145km of riding. The outcome should be another opportunity to witness a bunch kick, but with Marcel Kittel’s dominance only increasing, he may find allies wishing to chase down the day’s break alongside him dwindling; the escapees could cause a stir perhaps. Marcel Kittel has repeatedly turned in such ruthless performances at this year’s Tour de France, that it now seems futile to analyse his performance beyond the fact that nobody else seems near his level right now. Having surfed the wheels in the final kilometres with only a single leadout man to help him during yesterday, Kittel calmly found a route to the head of affairs and then proceeded to bury the competition with ease once again. If he finds rival teams willing to help control the day’s breakaway and eventually reel them in, then it looks like another victory is on the cards for the current green jersey holder. Nacer Bouhanni and his Cofidis team did perform well on Stage 10, though it soon became apparent that the Frenchman is still unable to begin eating into Marcel Kittel’s lead once the sprinting kicks off at full speed. 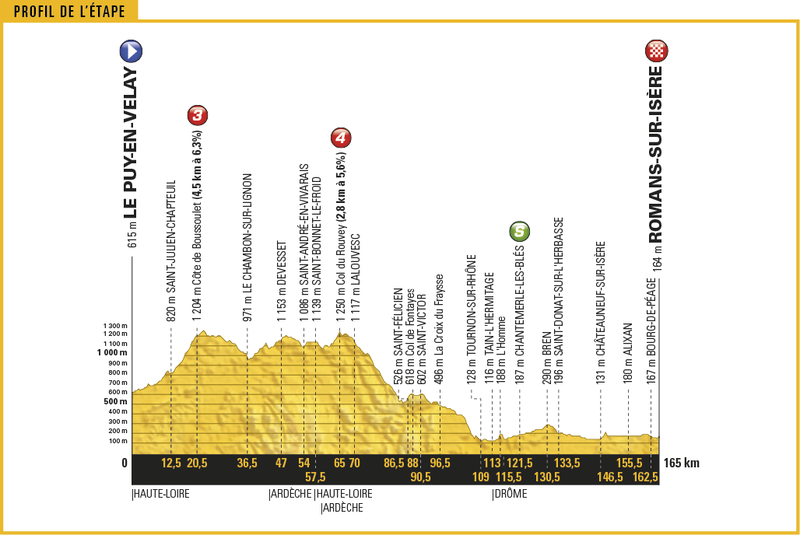 Though today’s finale contains a few roundabouts, it should prove less technically demanding than the previous day’s run to the finish, likely to make Bouhanni’s chances of winning smaller once again. André Greipel saw the brilliant work of his Lotto-Soudal leadout train amount to nothing more than an unexpectedly poor 11th place finish on Stage 10. Having ridden hard in the final kilometres to shield their captain from the wind and convincingly marshall the front of the peloton, Greipel was unable to produce an effort capable of challenging Marcel Kittel as previously seen. As stated before, the longer the race goes on the better Lotto-Soudal’s chances will be of nabbing a stage win off Kittel, especially once the attritional nature sets in. Dan McLay finally timed his sprint earlier than previously seen at this race, though admitted himself that starting so much earlier than his rivals was only ever going to result in him dying before the line. Regardless, the performance will have provided a degree of confidence to the British sprinter and he will now have greater insight to time his attack perfectly on the next attempt. Alexander Kristoff has seen his leadout team work well so far, but they will have to work wonders if they are to catapult the Norwegian beyond the blistering acceleration of Marcel Kittel. This longer distance will favour Kristoff, though it is not gruelling enough to really bring his grittiest talents into play en route to Pau. If they can lean upon Quick – Step to commit an even greater effort to the chase, then their extra energy might be able to put Alexander Kristoff in a favourable position heading into this relatively short 600m finishing straight. Other sprinters likely to contest the day’s outcome are Edvald Boasson Hagen, Rudiger Selig, Dylan Groenewegen and John Degenkolb. The sprinters shall once agin return to centre stage after the rest day, taking up the spotlight on the road from Périgueux to Bergerac, hoping to battle it out at top speed for the honours some 178km later in the day. With little to concern the fast men and their leadout trains in regards to gradients, only a couple of Category 4 ascents punctuate the day’s racing en route to Bergerac; the Côte de Domme and Côte du Buisson-de-Cadouin. With little to fret over during these ascents, the focus shall remain upon the final kilometres intended to set the day up for a brilliant exhibition of speed and skill. The finale could play into the hands of a strong leadout as a result of late road furniture, though the run to the line should see a high speed contest crown the day’s winner, there are two late 90 degree bends to negotiate before the finishing straight. Marcel Kittel has appeared imperious during Le Tour de France up until now, often managing to secure stage honours despite a less than ideal leadout by his teammates. He has recently suffered the loss of a key man in the shape of Matteo Trentin, though the depth of talent is so great at Quick-Step, it does suggest that Kittel shall still be able to perform at his best regardless. He has survived the gruelling mountain stages well in the last couple of days and will be eager to return to winning ways on Stage 10 in pursuit of the green jersey. André Greipel might not be the dominant force he once was, but there is a general sense that he shall leave 2017’s Tour de France with at least once victory to his name. Often only coming to the fore once the attritional nature of the race has begun to take its toll, the German great should start to see his chances of a victory improve as a result of the recent barrage of ascents. His leadout train has been one of the best so far, and now with the absence of Arnaud Démare and reduced firepower of Marcel Kittel, his hopes of taking a win will have improve dramatically. Dylan Groenewegen is seeking to take his place at the top table of sprinting during this year’s race, yet has not quite found himself pushing the established names close for a win. Despite the Dutchman’s immense physical prowess, he has still been left short by his teammates, often leaving him with too much work to do during the final kilometre of a stage. Regardless, the talent which he has is strong enough to succeed, so he will be hoping that the attritional nature of the race begins to bring stronger riders closer to his level during the second week. Alexander Kristoff should be in the mix for the sprints during the race this year, though this opportunity might appear too early for the Norwegian to truly land a killer blow. Often relishing in the gruelling nature of a grand tour, Kristoff has previously performed well in the latter stages of major races, though has not truly showed enough to suggest this shall be the case in 2017. He is a canny rider despite this absence of form and it would be reckless to rule him out of contention when considering his talent for measuring his efforts perfectly on the way to victory. Nacer Bouhanni should have a stage victory at his home grand tour by now, yet things have not managed to play out as intended for the passionate French cyclist. He is often unable to realistically match the big name sprinters, but now the fatigue is beginning to take its toll and others see teammates vanish from the race, Bouhanni should thrive in these more chaotic battles for the win. His acceleration is blistering to say the least, so on a technical and short stretch into the finish at Bergerac, the fiery Cofidis captain will fancy his chances. Edvald Boasson Hagen has turned in a great shift for Team Dimension Data so far in the wake of Mark Cavendish’s forced retirement from the race during the opening week of racing. Though a rider who prefers tougher and more gruelling affairs, the skills of his leadout train has demonstrated their ability to launch the Norwegian hero into contention during this year’s race.